At the heart of The Lindner Center for Conservation and Research of Endangered Wildlife (CREW) is the CryoBioBank®, known scientifically as a genome resource bank. 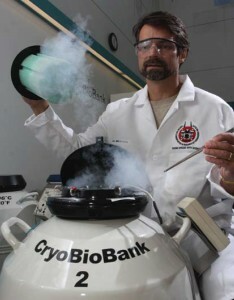 CREW’s CryoBioBank® contains thousands of samples representing hundreds of animal and plant species all stored in tanks of liquid nitrogen at -196° C. Plant samples include seeds, spores, tiny shoot tips and embryos, whereas animal samples include sperm, oocytes (unfertilized eggs) and embryos. Our world-renowned scientists form critical partnerships with other leading conservationists and governmental and non-governmental organizations to achieve CREW’s mission to Save Species with Science®. Why is the CryoBioBank® so important? It provides insurance against the loss of the world’s current genetic diversity. It serves as an alternative to transporting live animals and plants between zoos, gardens and countries. It offers a means of rescuing and storing genes and later producing offspring from animals and plants that did not reproduce naturally in their lifetime. Freezing plant and animal tissues greatly extends the genetic lifespan of any individual plant or animal. Space in zoos and botanical gardens is inadequate to house the numbers of animals and plants needed to ensure a high level of genetic diversity for the next century. It provides material for future studies. Although the concept of CREW’s CryoBioBank® sounds simple, in fact, it is rather complex and challenging for scientists. Protocols for cryopreserving sperm or seeds from one species may fail completely in other species, even those that are closely related. At CREW, scientists are dedicated to developing successful tissue and gamete cryopreservation methods for a multitude of endangered species. It is an important part of CREW’s mission – Saving Species with Science®. CREW’s CryoBioBank® is a cryostorage facility for long-term germplasm storage of seeds and tissues of endangered plants. Cryopreservation uses liquid nitrogen (LN) (-196oC/320oF) to preserve living tissues in a stable condition for long periods of time. It is thought that LN storage can preserve tissues for decades or longer. Regional Seed Bank – Seeds of species listed as endangered, threatened or potentially threatened in Ohio, Kentucky and Indiana. Ferns-International Pteridophyte Bank – Spores and tissues of ferns and related species. CREW researchers have developed procedures for storing both brown and green spores, as well as gametophytes and shoot tips of ferns. Mosses-International Bryophyte Bank – Tissues (gametophytes) and spores of mosses and liverworts. Endangered Plant Tissue Bank – Shoot tips from the tissue culture lines in the Endangered Plant Propagation Program. Experimental Collection – Non-endangered seeds, shoot tips and other tissues that are in long term storage to evaluate their viability over extended storage times. Samples of these are thawed periodically for evaluation. In some cases duplicate samples are being stored at –20 degrees Celsius and at 4 degrees Celsius to compare viability over time at these temperatures and in liquid nitrogen. Learn more about The Lindner Center for Conservation and Research of Endangered Wildlife here.